Blessings. I love your site. Thank you for the info, it's very informative and has helped me a lot. My friend just became pregnant ;)) I made her a bracelet for helathy pregnancy that consist of Unakite, Rose Quartz, Moonstone and Malacite. Her husband would like one too! How sweet is that! So I was thinking Unakite and maybe some Amber? Any suggestions on stones for the male to use to support a helathy pregnancy and birth for him to wear as his wife carries and delivers. Thank you and many blessings!! Congratulations to your friend on her pregnancy...she and her husband are very lucky to have someone as thoughtful as you in their lives! The crystals that you chose for your friend's bracelet are perfect choices to help with a healthy pregnancy. Unakiteand Amber are also good choices for a men's bracelet. I'd suggest Black Tourmaline to add protection against negativity, and some Green Aventurine. 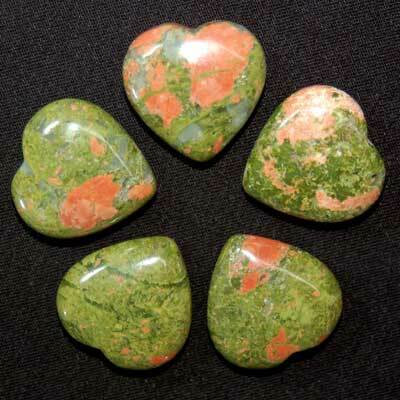 Green Aventurine is a wonderful, loving heart chakra stone (but it looks a bit more masculine than Rose Quartz), plus it is also brings good luck. Golden Tiger Eye would also make a nice addition, it is also a protective stone that helps bring in optimism and abundance.